Each of our skin care kits contains a derma roller skin roller, Vitamin C Hyaluronic Serum and Centella Soothing Cream all neatly packaged in a clear skin care bag. Our Derma rollers are UV/Gamma sterilized for your protection and are made from stainless steel and titanium with 0.3mm micro tips. Use our premium vitamin C boosting serum for unbelievable improvements to your skin. Use regularly as part of your skin care routine to achieve results usually expected from a professional salon treatment. With high penetration and anti-oxidation stability, our serum can stay on the skin for up to 6 hours. The Hyaluronic acid, known as a hydration booster holds up to 1000 times its weight in water. That combined with the VC serum can boost and store moisture, in your skin, up to 10 times longer than normal giving you a clearer and healthier complexion. With a built in natural protection barrier, our Vitamin C serum can help protect your skin from outside influences including environmental pollution, light pollution and the pressure of the busy city. 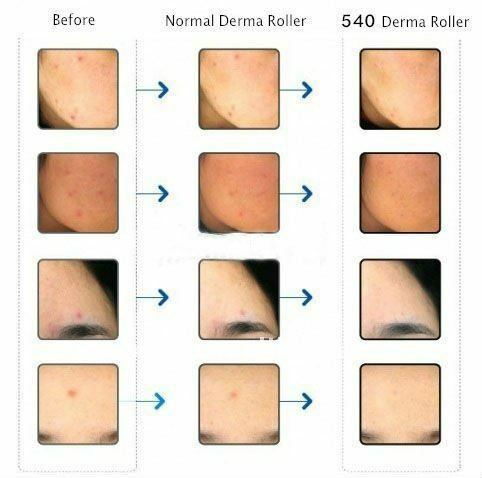 It can effectively work to treat dull, fine lines, pores and other skin problems. It also works to improve the skins self-repair effect, making the skin surface stronger with the ability to protect it from further infringements. Your Skin Is Important.. Treat Your Skin With This Secret Skin Care System Proven To Repair, Revitalize And Promote Healthy Skin!